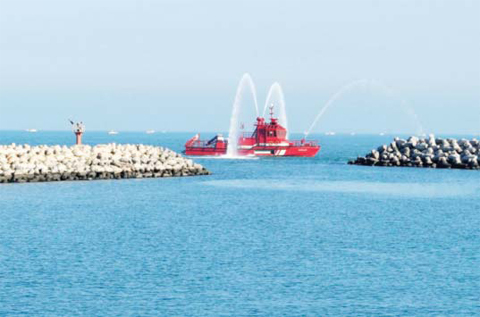 KUWAIT: The Kuwait Fire Service Directorate (KFSD) held a ceremony to launch Rescue and Fire Extinguishing boats and vehicles yesterday at the Coastguards Department in Salmiya. Director General of KFSD Lieutenant General Yousef Al-Ansari said during the ceremony that the KFSD’s projects are part of the Kuwait’s development plan. “Today we are celebrating the launch of the new fire extinguish boats and vehicles that are part of the batches from 4-7 of our plan. Without the financial and administrative support of the government, we wouldn’t have been able to achieve these goals,” he pointed out. The Kuwait companies are strategic partners with KFSD in developing its performance and its machines. “We appreciate the partnership of or the local companies and I would like to thank them for their efforts. I would also like to thank all those who participated in making this ceremony successful,” Al-Ansari added. Brigadier Jamal Al-Bleihis said “KFSD cares about rehabilitating the firefighters and equipping them with the latest machines, vehicles, and boats.” These equipments that are exhibited here today are not the only ones imported. The total number of machines, vehicles and boats is 191. Only 21 of these kinds are on display today. All these equipments will start operating from today and they represent great addition to the KFSD’s abilities in dealing with all kinds of land, marine, and airport accidents,” he stated.